If anyone had doubts about the quality of the Borussia Dortmund team or the ability of the younthful side to hold onto their Bundesliga title lead, those doubts were given a swift boot at a packed BayArena Friday evening before a world-wide TV audience as Dortmund defeated Bayer Leverkusen 3-1. The second half of the 2010-2011 Bundesliga season was kicked off in style as Jurgen Klopp’s Yellow-Blacks showed their poise and determination in downing a quality Leverkusen side that was tied for second place with FSV Mainz 05 behind Dortmund going into the match. The first half was pretty even statistically, although the visiting Yellow-Blacks certainly had more opportunities on goal. Klopp was without two of his most valuable offensive catalysts to start the match, as Shinji Kagawa is away with the Japanese national team for the AFC Asian Cup and striker Lucas Barrios started the game on the bench still recovering from flu. In their places, Klopp started his two Polish international attackers, Jakub Blaszczykowski and Robert Lewandowski, who have both contributed much to Dortmund’s outstanding season, mainly coming off the bench. Dortmund opened with the a good scoring chance in the 3rd minute, as Sven Bender’s header from Nuri Sahin’s free kick barely missed Rene Adler’s goal. Dortmund defender Mats Hummels then looked to open the scoring with a header from a corner kick in the 20th minute, but was wide left, while Leverkusen keeper Rene Adler came out of goal to nullify a Robert Lewandowski opportunity. Leverkusen seemed to have an answer to Dortmund’s attacking style, and one wondered if the absence of Kagawa and Barrios was going to cause Dortmund’s offense to sputter. But Dortmund had an answer for Leverkusen’s attack, also, as their young backline clogged the passing lanes and made Leverkusen’s attacking options look null and void. Mats Hummels in particular was outstanding, seeming to be everywhere, blocking shots and playing with a maturity much beyond his years. Leverkusen were unable to get anything going in attack until late in the half, when Stefan Kiessling missed on a header from a cross by Sidney Sam. As the half concluded, the two teams were practically even in time of possession and both had three corner kicks. Dortmund did have six shots to one for Leverkusen in the scoreless first half. Whether nerves, caution or a little winter break rust played a part in the scoreless first half of such an anticipated matchup, one knew that this match would not be goalless. And indeed, 22 year-old Kevin Grosskreutz made sure that the fans would see scoring. An omen of Dortmund’s potential to begin knocking in goals occurred early on after intermission, when Blaszczykowski streaked free down the right flank and crossed to Lewandowski, which Adler was able to knock away for a corner kick. It seemed like the cork was about to pop on Dortmund’s champagne attack, and sure enough Kevin Grosskreutz netted shortly afterwards from a long throw-in that bounced through Leverkusen’s suddenly inept defense. Four minutes later, Grosskreutz added a second goal as he netted on a low shot and then, within two minutes, the young German international assisted 18 year-old Mario Gotze and suddenly the score was 3-0 in Dortmund’s favor. Bang, bang, bang — three goals in six minutes and Leverkusen looked like they’d been run over by a steamroller. The first half chess match turned quickly into a heavyweight prizefight in which Jurgen Klopp’s boys were throwing all the punches. One wondered if Bayer Leverkusen’s dazed defenders had spent winter break studying VfB Stuttgart’s defending against Bayern Munich, as they became completely unglued and allowed what looked like a chance to gain at least a point to instead become a Dortmund rout. Leverkusen coach Jupp Heynckes responded at the hour mark by bringing in Arturo Vidal, Ever Derdiyok and Tranquillo Barnetta for Lars Bender, Patrick Helmes and Sidney Sam, but by that point the outcome was sealed. Levekusen’s attack picked up somewhat with the substitutions, and Stefan Kiessling netted a consolation goal with ten minutes remaining as he stretched and slid to knock the ball into the Dortmund net, banging his knee and shin hard against the upright. Unfortunately for Bayer Leverkusen fans, Borussia Dortmund’s lightning attack made Die Werkself look more like pretenders than contenders for the Bundesliga crown, at least on this Friday night. Dormund have now opened a 13 point lead over Bayer Leverkusen, while FSV Mainz 05 will need a road win over VfB Stuttgart to stay within ten points of the league leaders. Dortmund have proven themselves to be a truly exciting, quality team during the first half of the 2010-2011 campaign, and it appears that they intend on continuing their victorious ways. Notes: Friday’s match was broadcast in 196 countries. Die Werkself’s Michael Ballack warmed up in the second half, but didn’t see action. 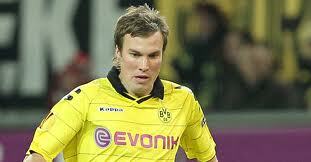 Grosskreutz’ goals were his fifth and sixth of the Bundesliga season, while Gotze’s was his third. It was good to see Kiessling get a goal after missing so much of the first half of the season with injury.